Russell Brand’s brilliant community projects 4th Birthday Party! We spoke to the brilliant head of events – Sarah Ward. Tell us what you have planned. 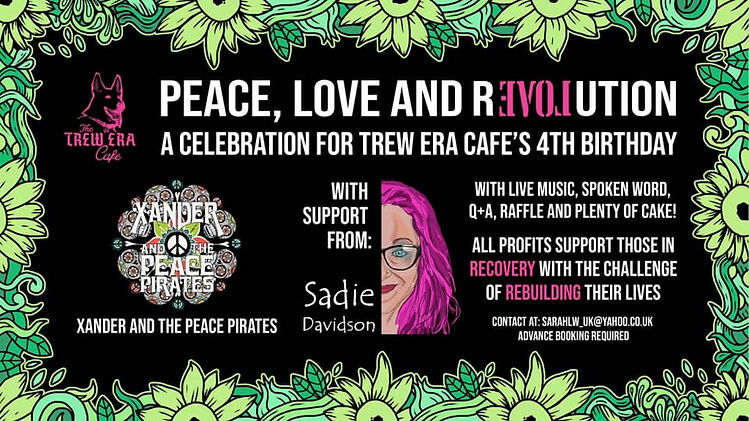 Sarah Ward: This will be a beautiful community-based celebration all taking place in Russell Brand’s iconic Trew Era Cafe, Hackney London, now run by The Forward Trust, which Russell is a Patron of. Russell is excited about this event! How did you choose the artists to play such an important gig? S: These two acts were chosen to perform as Russell funded the cafe with his book ‘revolution’ and these artists are revolutionary in their creative fields. It will be a full set from Xander & The Peace Pirates PLUS a Q&A. They are a really inspirational band. Their mantra is ‘The only solution to this soul pollution will be a spiritual revolution’ lead guitarist Keith Xander lodges a plectrum in his prosthetic hook to play. Check out his video on BBC 3s ‘Amazing humans’ it’s really quite a story! Sarah Ward: Sadie Davidson is an addict who has turned her life around and is now a playwright, poet and writer of prose. She’s written two books (poetry highlighting important social issues such as housing) and recorded an album. She’s an award winning spoken word performer. She will be performing for us as a support act and talking about her incredible journey & new book! Tickets for the event are ‘Pay What You Feel’, obviously they hope people will dig deep however every ticket sale will help turn lives around. All profits will support those in recovery through housing & employment. Due to Cafe capacity, tickets are limited & will be allocated on a first come first basis. Advanced booking is required, contact sarahlw_uk@yahoo.co.uk to make your donation & book your space! Puts the Minx in ‘Minx Media TV’. Heather is The Zine UK’s very own NYC Rock n Roll Chic. #NEWMUSICSATURDAY WITH ELLY BAILEY: 2. Fontaines D.C., ‘Dogrel’ does the double.